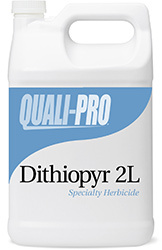 Liquid Dithiopyr 2L contains 23 percent Dithiopyr for preemergent and early postemergent weed control. Dithiopyr 2L is an easy-to-use, non-staining, liquid formulation for outstanding preemergent control of crabgrass, small seeded broadleaf weeds, and also provides early postemergent control of crabgrass. This specialty herbicide is for weed control in established lawns, commercial sod farms, non-cropland and industrial sites, ornamental turf (including to golf course fairways, roughs, tee boxes), container-grown ornamentals, field-grown and landscape ornamentals.